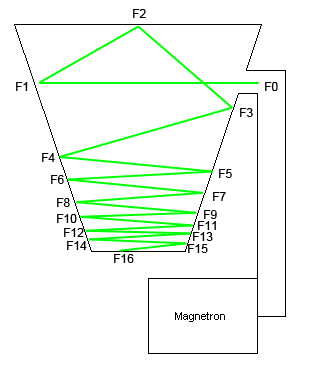 Most microwave sources include a resonant cavity. Waveguides are resonant structures. Most concerning for the present work are superconducting RF cavities in particle accelerators (see the attached picture). I have personally worked with cavities similar to those in the picture. They are superconducting at 4K being made out of niobium, and typically support >10 MV/m of electric field, with quality factors of several 10's of million. Any loss of energy to an external medium would have been readily apparent, and we would not be able to run the LHC if there was some unknown effect affecting these sorts of cavities. Not to mention... those walls are actually fairly thin! If we believe the EM drive thrust claims... they would have buckled under the strain and torn from their mountings. Those resonant cavities (as pictured) do not seem asymmetric to me. Di you ever work with a superconducting truncated conical (frustum) microwave resonant cavity before? They aren't perfectly symmetric. And even if they were always perfectly symmetric due to the existence of some conspiracy, that would merely balance out the claimed forces, still subjecting the cavity to (far greater than otherwise expected) stresses. edit: not to mention that any unexpected coupling between EM and anything else would throw off the cavity's parameters by a far more easily measurable amount than the thrust. I tried asking some of these questions before but they were quickly drowned out by senseless bickering, so I'm going to try asking again. (0) Supposing that you were able to engineer the required negative energy density around the craft in such a way as to produce an Alcubierre style warp bubble. The spacetime curvature in the CENTER but the edges of the bubble itself would be highly warped, and yet you need to have engineered some structure to hold the negative energy density ring in place. Thus it seems that the warping of spacetime would necessarily destroy any toroidal structure used to hold the negative energy in place, making it impossible to maintain such a bubble. Am I missing something here? (1) The Eagleworks team reportedly made a simulation to predict thrust levels based on the assumption that the vacuum energy of empty space behaves like a plasma which is mutable as suggested by Dr. White. Then, virtual particles would be able to store and propagate momentum as a wave from one virtual particle to the next until it reached a non-virtual particle to finally absorb the momentum. Thus the EmDrive would leave a "wake" and this is exactly how White described it. However there seems to be a problem with this explanation, because with the EmDrive being a resonant cavity, any such QVP wave would need to be initially generated INSIDE the closed cavity, which means the first matter this virtual particle wave would interact with would be the walls of the cavity itself, which would absorb the opposite momentum and thus cancel out any net thrust. What additional assumptions were made in the simulation to make this not cancel out? (2) In "The Alcubierre Warp Drive in Higher Dimensional Spacetime", White and Davis (2006) theorized that, under the Chung-Freese model they predicted any torus of positive energy density would give rise to slight negative energy density in its core due to classical energy in 3+1 dimensions being shifted "off brain" into the unobservable higher dimensions. They proposed an experiment to test this by constructing a charged capacitor ring. However, under the mass-energy equivalence, a rapidly spinning torus made of lead would have orders of magnitude greater positive energy density -- so why were they using capacitors in their experiment? (3) If it were true that any torus of positive energy density contributes to a "boost" factor inside the torus, then it must be to an incredibly small amount, or else people would have noticed by pure chance that objects inside torus tend to move faster, and nobody has noticed this. However, we have noticed that large heavy toruses require more fuel to propel. Thus it seems that this theory of a positive energy density torus giving rise to a net boost in thrust must be impossible. (4) In "Experimental Concepts for Generating Negative Energy in the Laboratory" Davis and Puthoff (2006) showed that negative energy density was producible in the lab using high energy lasers and other methods, and this would not require the more radical assumptions of extra dimensions in the Chung-Freese model. Why weren't these methods explored? (5) On Rodal's writeup he mentioned that skeptics were hesitant to accept the idea of a mutable QVP because "The mainstream physics community assumes the Quantum Vacuum is indestructible and immutable because of the experimental observation that a fundamental particle like an electron (or a positron) has the same properties (e.g. mass, charge or spin), regardless of when or where the particle was created". However, if the QVP was storing momentum then any non-virtual particles exposed to it would merely absorb this momentum, which would restore the QVP to its usual ground state without changing any more fundamental properties. Thus this criticism seems to be moot. I think that are some great questions . In response to your own question, where does the momentum go? Well, I think I have a proposition. To be completely honest I am very very interested in astronomy and physics in general, but I am not a mathematician by a long shot. I am the philosopher-type astronomer, and I like to think that my ideas, however weird or stupid they may seem to some, can give others handles to ascertain the true nature of this truely remarkable discovery. WHat I was thinking (and I now assume QV is useable and potentially limitless as far as energy contents go) is that the QV is NOT a static medium (virtual particles are made and destroyed continuously by the QV) but more like an energy buffer. Is it possible QV is extradimensional? It seems to me that CoM and CoE are both not broken, if the QV acts like an energy bank, you lend energy from it, and the energy and momentum are poured back in to the QV when the virtual particles, including their momentum, annihilate eachother and are consumed by the QV again. This way the QV retains it's energy and momentum (on average). Indeed like wind and a sail. I also agree on the statement of some that there will be non-linear acceleration when converting electrical energy directly to kinetic energy, there's no such thing as truely free energy. Even with a potential energy well like QV we have to put energy in to get energy out. If the efficiency of that method ever exceeds 1:1 I will be surprised. Another thought of mine was: Could Back holes be a funnel to the QV? And that this way the energy that was released in the (assumed) Big Bang, is absorbed back into the QV? Could this in any way be connected to the spontaneous creation of virtual particles? Third pondering: If the QV is not indestructible/immutable, is it possible that the QV is responsible for dark energy? Someone else in this thread proposed that the concentration of energy in the QV could be dependent on how much mass is in the vicinity, etc. I see a link in these two postulations. If Dark energy is amplified by the presence of matter that could explain a few things. A message I posted before, with additions and edits from @Rodal. I am happy that we are finally getting some new talent here. If your post doesn't bring something useful or valuable to the table, put it in the other thread. With that said, we welcome (and are actively recruiting) new people. We're actually trying to figure out a difficult problem here. This isn't a fan club. Hostile posts from less-moderated or un-moderated threads are bleeding over here. Keep insulting posts out of here please. If you are feeling emotional, try a different approach besides handwaving and quitting. If you are unhappy with some conjecture, dig up some science to explain it another way, and tell us about what you learned! Don't like the experimental setup? Offer CONSTRUCTIVE criticism with a reference or construct one on your own. I don't want to see this thread derailed ONCE AGAIN by outside agitators. Some specific examples (among many -sorry to not mention all -) of previous constructive, skeptical criticism on the test set-up are the numerous posts of @frobnicat and @zen-in. They are objective, logical, analytical, systematic, methodical, and they follow the scientific and engineering method without resorting to abusive language. Abusive or insulting language is not part of the scientific method. The pen is mightier than the sword, but logical, objective arguments are much more powerful than abusive words. I haven't been following these threads closely until recently, but I'm really curious if anyone here has examined whether or not Modified inertia from Hubble scale Casimir effects (MiHsC), which is a theory I just came across today, makes any sense at all. I never got far enough in math to really evaluate this level of physics on my own, but the "crackpot" alarms in my head didn't sound as I was reading about it. The basics of it are, any object moving to the right will create an event horizon somewhere to left beyond which information cannot be observed. Like other event horizons, this will result in radiation (similar to Hawking radiation) called Unruh radiation. The wavelengths for this radiation are at normal accelerations on the order of light years. But if you have something like a tube with light inside and reflective surfaces, the photons (because of their speed) will generate Unruh wavelength that are the exact resonant frequency of the tube. In a uniform tube, this does nothing, but in a cone shaped tube, it would bias the direction of force toward the narrow end. Again, this isn't my theory, it is proposed by a physicist at Plymouth U in the UK, but it seemed... reasonable. The theory evidently also has the nice benefit of explaining the effects of dark matter and dark energy without any special tuning, and it explains how inertia works in general from what I was reading. Does any of that make sense or sound plausible? EDIT: I ask mainly because a device like the EmDrive is one of the only testable predictions that you could make with this theory given the technology we have now. Back on the subject of logical and constructive discussion...would you mind responding to the points and questions I just raised above? Seriously though, if an array of PMTs or APDs is set up to capture key parts of the solid angle of radiation and a flux of 0.511MeV gammas is detected manly spewing out in the direction of thrust this would provide support for Dr. White's theory. If such radiation is found, one could use simulations (e.g. Geant4) of the apparatus to see exactly how things mesh with different theories. I'm thinking to first order this could just be 6 PMTs placed on +/- xyz axes, though with enough PMTs you could capture a significant portion of the solid angle which could be used to track the momentum of the generated particles. This would really give us a clear picture of what is happening here. On the test set up. My understanding from what star-drive posted, that the power was about 50 watts, and there is a total of 16' or "RG8" coax between the amplifier and the frustum. Q1 Was the power measured at the frustum with a directional coupler and power meter, or is that the rated power of the amp? Q2 what's the lay line information on the cable ( manufacturer and number )? Next, using this new Q-V plasma simulation tool that utilizes the instantaneous E&M fields from COMSOL for one complete RF cycle in 5 degree increments as its input file, we are now seeing why we need the PTFE or HDPE dielectrics in the frustum while using near pure sine wave power levels below ~100W in the ~2.0 GHz frequency range to generate detectable thrust, and why Shawyer and the Chinese didn't while pumping 80W to 2,500W using magnetron RF sources. We think the reasons are two fold. 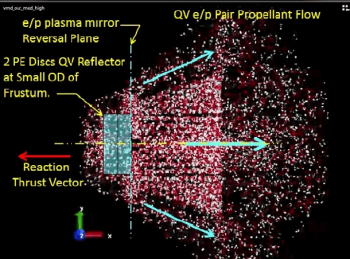 The second reason we found running these 3D Q-V plasma simulations for the EMPTY copper frustum, was that increasing the input power tends to focus the Q-V plasma flow from near omnidirectional from the frustum at low powers, to a much more jet like beam at higher powers measured in kW to tens of kW-rf. In fact the simulation for the 100W run predicted only ~50uN for our pure RF system with dielectric, while the 10kW run predicted a thrust level of ~6.0 Newton without a dielectric in the cavity. And at 100kW-rf it was now up to ~1300 Newton, but the input power to thrust production nonlinearity was starting to taper off around 50kW. Of course these Q-V plasma thrust predictions are based on the Q-V not being immutable and non-degradable, a feature we admit is not widely accepted by the mainstream physics community, at least at the moment. 1- How (i.e. what is the physical cause) does the dielectric enhance and control (hence is mandatory) that almost omnidirectional flow of virtual particles at low power, into a detectable thrust, as per Dr. White's QVF conjecture? Maybe I missed some important messages in the thread, but since there is more and more reactions to your posts and to the NSF news article in the media and twitter, and since Eagleworks hasn't published anything yet about the EmDrive vacuum tests, the RF resonant warp experiment, and the newest simulations, I think those claims (let's start with the low power dielectric and high power spike modeling of QV flow) deserve more explanation. As discussed in the article, these are reported results from the computer model of Dr. White. Whenever there is a numerical computer analysis result reported, the validity of the results is entirely dependent on 1) the validity of the physical model underlying the numerical model, 2) the validity of the numerical implementation, 3) the validity of the computer programming ("bugs" and any errors of any kind) and 4) the validity of the input data. Even if the computer simulation is valid (under the previously discussed considerations), the results of a complicated numerical analysis may not be readily understood. For example, entirely valid results from numerical simulations of nonlinear dynamic impact and explosive blasts on aerospace structures are very difficult to understand without careful consideration (ideally, difficult to understand computer predictions should always be backed up by experiments). Examples abound, think for example of how possible impact of foam was mishandled and misunderstood by NASA on a Space Shuttle disaster. Experimental testing is needed to verify these computer analysis predictions. Reportedly this will occur in June or July of this year. If this is the experiments I am thinking of, I believe the point of the capacitor vs the lead torus was that they would be more easily able to adjust it. On state vs Off state, or even partially charged states. Less physical poking at the rig to adjust the variable in question. Plus, it might be a bit safer than rapidly spinning the lead torus (though I wouldn't know how fast they'd have to spin it, so I could be wrong on that point). Go back and read the entire thread, you'll find they already did most of what you suggested. Their Rig has been tested and has not been falsified. There is another explanation that has been around for many decades, it is that variations in the gravitational field are indistinguishable from variations in the refractive index of the vacuum. When you refer to the Lorentz invariance of Maxwell's equations, this does not hold in a vacuum where epsilon0 and mu0 are variables. In General Relativity we refer to the metric components, g^uv. These can and are interpreted as components of a variable refractive index, in the Polarizable Vacuum Model. Primarily refined by Hal Puthoff, a few papers of my own and many others have contributed to it. There are many, many papers on this available. In this case, the interior energy density is not symmetrical, so the refractive index has a gradient. It was said in a previous post that the speed of light inside is different than it is outside. This is the correct interpretation, however it must include a gradient in the refractive index, as it passes through the structure itself, to cause motion. The gradient in the refractive index "is" a gravitational field. That is what the warp drive requires. In a separate experiment, they may have shown that the speed of light inside the chamber varies. The amount is varies would only be noticed "IF" you were looking for it. Most resonant systems are "tuned" to eliminate such affects in manufacturing. In such a small cavity, I'm not confident it can be measured. Edit: Many decades is correct, I'm 40 years out of date trying to catch up on any changes. No problem, most of the stuff is on Research Gate and Vixra. Also, look at the references therein. As many here know, I have been pursuing time-domain modelling (FDTD, using Meep from MIT) of the EM thruster with the thought that thrust may be generated by evanescent waves escaping through gaps in the construction. My conclusion is "No." While evanescent waves do appear to consistently generate on the order of 10% greater thrust than an ideal photon rocket, that is orders of magnitude below the experimentally measured forces. Recall that the ideal photon rocket uses an ideal plane wave as the drive and the evanescent waves escaping via the EM thruster gaps are anything but ideal plane waves so slightly greater forces are reasonable. I can just barely read the math, but I need a Drude-Lorenz model of equation 33 in order to make any headway. Second, does anyone want to provide a Drude-Lorenz model of the QV? And I agree with Dr. Rodel, results from a numerical model must be very carefully evaluated as it could easily mean nothing. Results from two completely different numerical approaches to the same problem can also mean nothing, but if they were in good agreement that would be something to consider seriously.